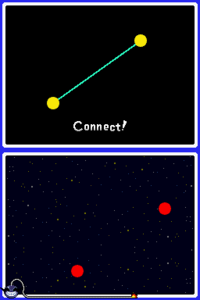 Info "Connect the stars to draw a constellation. If the line breaks, you aren't connecting 'em right!" What's Your Sign? is a microgame found in the Ninja Scribble stage in WarioWare: Touched! The objective of the game is to connect the dots as shown on the top screen. 1st level difficulty: The player's dots are lined up identically to the one on top. 2nd level difficulty: The player's dots are flipped or moved compared to the one on top. 3rd level difficulty: The player's dots are flipped around, and the design is usually complex. This page was last edited on April 7, 2018, at 02:04.